Theme Hospital was arguably the best of Bullfrog’s management simulations, which makes it all the stranger that it hasn’t been mimicked up to this point. If you want a modern Theme Park, Planet Coaster will happily let you on that ride. If you want a modern Dungeon Keeper, you have several options that are admittedly less good, but still decent. 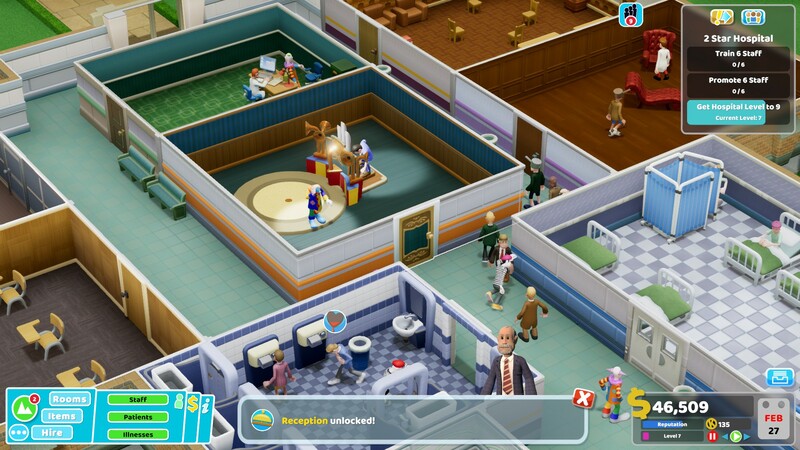 If you wanted a modern Theme Hospital, however, no other treatment was available. The only remedy is the same one prescribed 20 years ago. Perhaps that’s because everyone agreed Theme Hospital nailed the concept first time around, although that doesn’t usually stops the games industry from copying a successful idea. 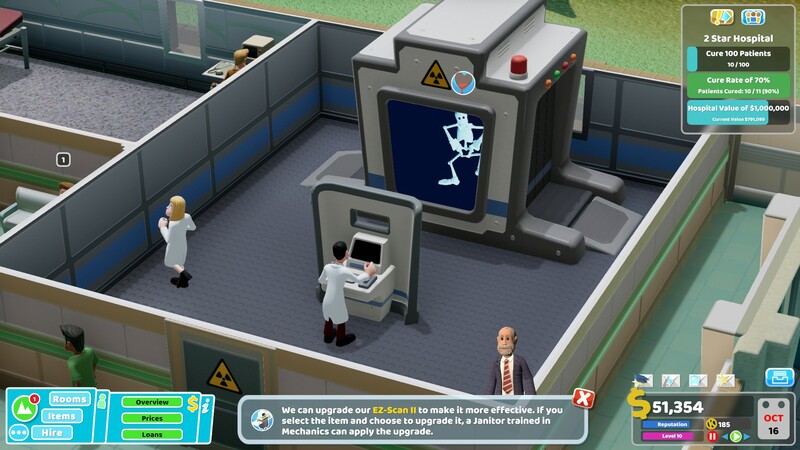 In any case, it took the original creators of Theme Hospital –Mark Webley and Gary Carr – to finally follow up the idea with what amounts to a sequel in all but name. When I heard about Two Point Hospital, I was naturally excited, but also curious as to whether the game could do more than play the same record. As it turns out, the answer is not really, but when you play the record this well, it doesn’t matter. 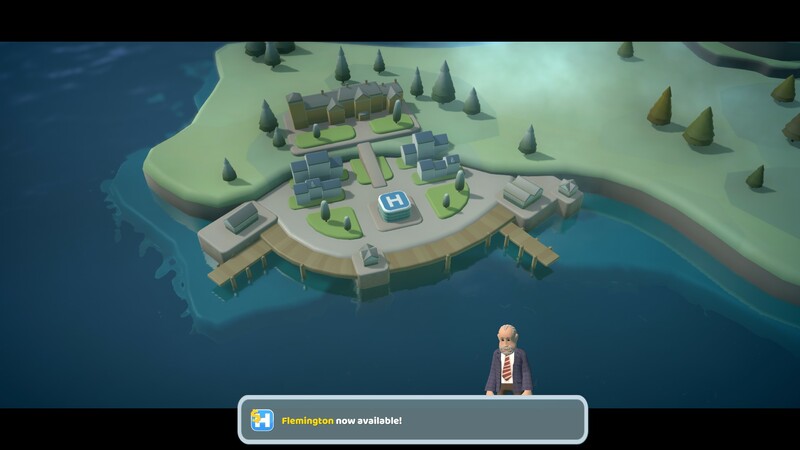 Two Point Hospital is a superb modernisation of that original concept, gorgeous to look at, thoroughly engaging, and negotiates delicate balance of depth and accessibility. 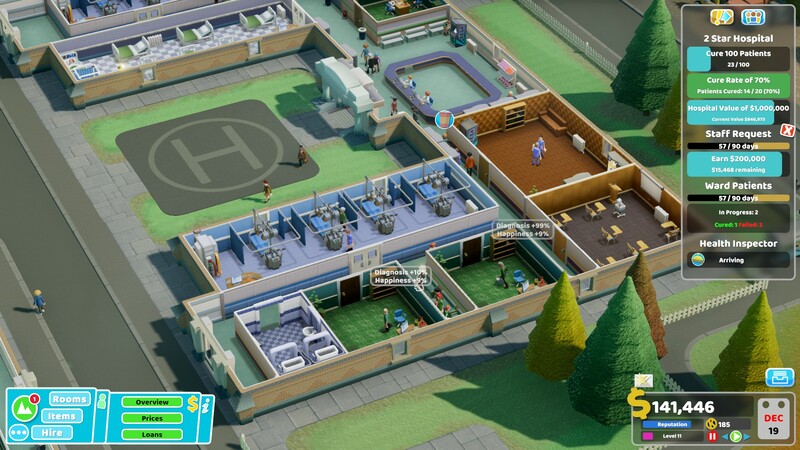 Two Point Hospital tasks you with building and managing a network of hospitals across the fictional Two Point County, which if it were real would have the best medical coverage of any county ever. It’s got more doctors than a Tom Baker fan convention. Two Point County appears to need it, however, given the wide variety of strange ailments the inhabitants suffer from. To get each hospital up and running, you’ll need to build rooms, place items, and hire several types of staff. Doctors diagnose patients and treat specialised diseases, while nurses manage pharmacies and wards to look after patients with less serious ailments. You’ll also need to hire janitors to keep the hospital clean and maintained, and assistants to man reception desks, cafeterias, and so forth. The clean, claymation-like aesthetic perfectly encapsulates this light-hearted tone. But it’s the character animations that stand out above all. The detail is truly remarkable, with bespoke animations for almost every action in the game, all of which are laced with Two Point’s daft humour. A janitor cleaning a toilet will often disappear halfway up the U-bend, while a patient receiving an X-ray will do a Disney-style skeleton dance while inside the machine. I think my favourite is the animation for treating light-headedness, in which the patient sits inside a giant machine that unscrews the lightbulb head before replacing it with a new head. The way the patient twitches with discomfort with each turn of the screw is so impressive. As well as looking great, Two Point also feels really satisfying to play. Dragging out rooms and placing objects like doors and beds all has a similar sense of weight and tactility that you get in games like Cities: Skylines. Two Point also encourages players to home in on the details when designing their hospital. A GP’s office, for example requires a desk and a filing cabinet, while a Pharmacy only needs a medicinal centrifuge to function. Yet while these will fulfil the basic requirements, adding additional items such as pictures and plants for decoration or radiators for heat, will both make your patients and staff more comfortable and add to the “prestige” rating of a room, resulting in happier, more efficient workers. Frankly, though, it was obvious from the early footage that Two Point Hospital would hit these goals. 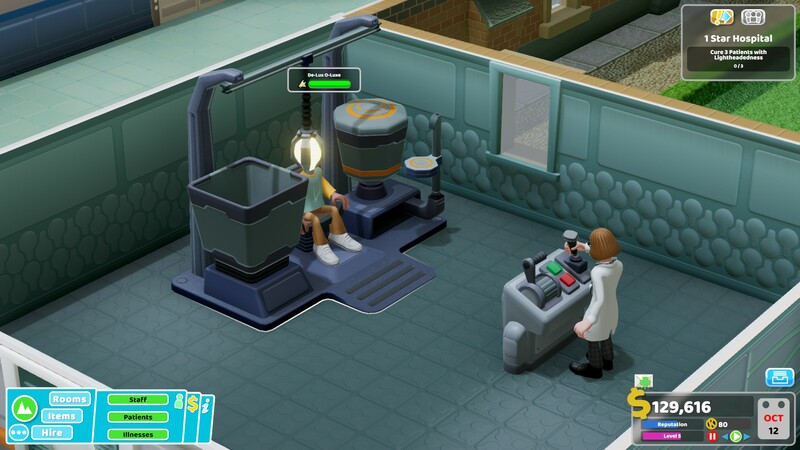 The question that remained was, could Two Point hospital sustain its daft hospital simulation across ten, 20 hours of play? The answer to that is a definitive yes. 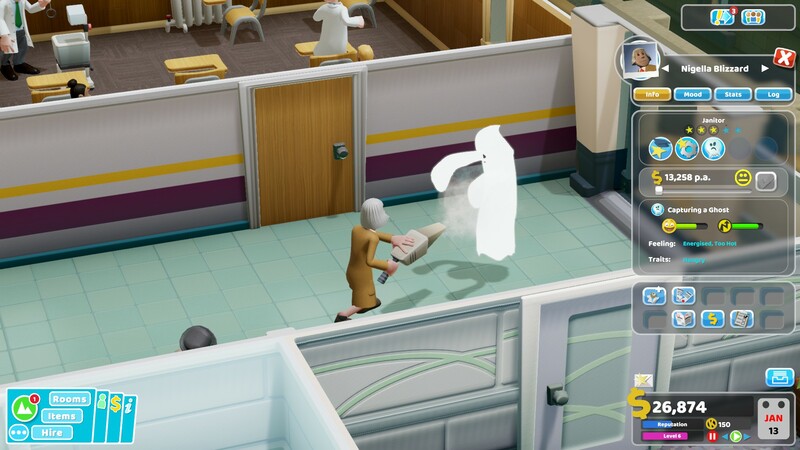 In fact, Two Point Hospital is beautifully paced. The game uses a couple of different systems to track progress. 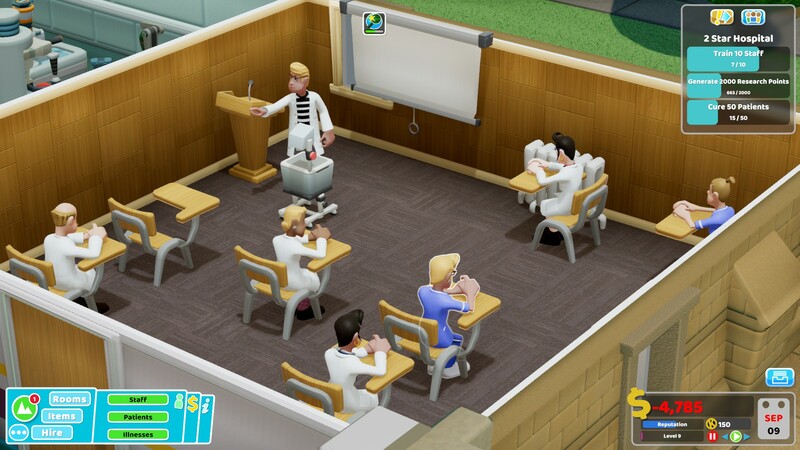 Each hospital you build can achieve a maximum rating of three stars, but you only need to unlock the first star before you can proceed to another level. This lets you move through the early game relatively quickly, but return at any point (with new rooms and items available) to try to attain those other stars. Doing so earns you bonus items that you can place around your hospital, such as more advanced equipment that lets you diagnose and treat patients faster and more accurately. In addition, each objective you complete earns you points that you can use to buy additional items for your hospital such as snack machines and magazine stands that help keep your patients patient while they wait to see a doctor. Impressively, few of these items are purely cosmetic; nearly all of them provide some function or improve your hospital’s rating in a particular area. Both these systems help provide goals and rewards to keep you engaged. But the real success of Two Point Hospital’s pacing is less down to feedback loops and more to simple craft. The developers have been careful to ensure a steady influx of new illnesses and new treatments to cure them as you progress. By the mid-game I had well over a dozen room-types unlocked, including X-ray machines, research centres, and a clown-rehabilitation clinic (which is a generous way of dealing with clowns, in my opinion). And there were a whole bunch more waiting deeper into the game. In addition, each hospital offers its own set of challenges. One attached to a University unlocks the Research Centre, with the requirement that you only recruit junior doctors with no skills so they can be trained up. Another, situated near an abandoned power plant, has been heavily damaged by freak lightning storms, which continue to electrocute your doctors and patients as you try to clean up the mess. These unique challenges, along with the gradual stream of new rooms and illnesses, keep the simulation feeling fresh and interesting. It’s a pretty good simulation too, although more impressive than its depth is its clarity. Two Point excels at communicating the simulation’s underlying processes, and this makes it very easy to identify and solve problems. Often, these problems revolve around making the journey from admission to cure as efficient as possible, as you only get paid big money for actual treatment. Hence, if there’s a big queue outside your GP's office, it’s probably wise to build another one, otherwise you’ll find your revenue flow quickly stymied. There are a few issues. I don’t like the music, which is scratchy elevator jazz that I found really grating. Ironically, the game makes a joke about 'Music to play Sims by,' but its own score never comes close to approaching the quiet majesty of Buy Mode 2. I do like that the audio includes its own hospital radio DJs, however; that’s a nice touch. Elsewhere, managing your staff can be awkward, particularly when it comes to training new skills. There are lots of different skills, and training staff in a new one is A) expensive B) forces you to pull them out of rotation for lengthy periods, which can cause your hospital to grind to a halt if you’re not careful, and C) boring. Researching new technologies also takes way too long. The only times I’ve been stuck for something to do in Two Point Hospital is when waiting for a research project to complete. In its defence, the game does let you research faster research, however absurd that idea may be. 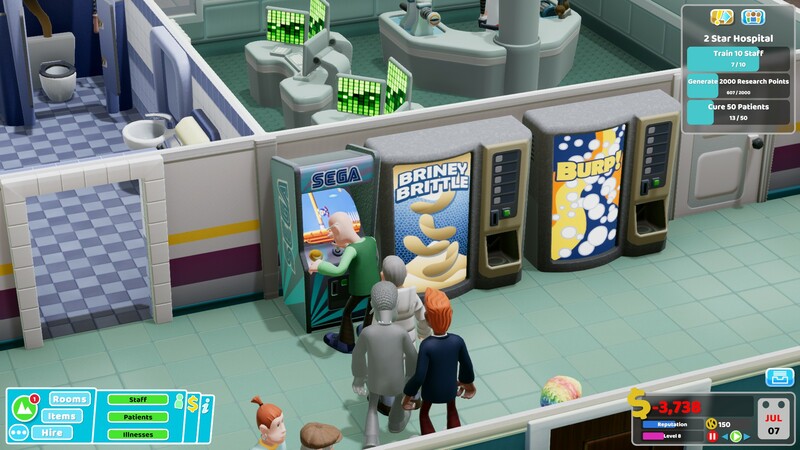 Aside from these niggles, the worst you can say about Two Point Hospital is that it’s offering largely the same cure for a chronic case of spare time that Theme Hospital did 20 years ago, just with a shinier package and differently shaped pills. But that doesn’t make the treatment any less effective, and the work Two Point has done in modernising and iterating on that original premise pays off dividends. I never thought I’d say this, but it feels great to be back in hospital.